The amount of daily junkmail that finds its way to our mailbox is unfathomable to me, and whether I toss it in the trash or recycling bin, I still always feel a twinge of regret. Paper is one of my favorite things, and it seems so wrong to have pages and pages of the stuff pass through my hands for mere moments before being relegated to the incinerator. 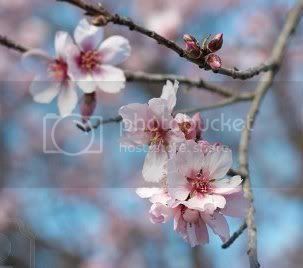 It’s not the trees’ fault that coupons for carpet cleaning and sports bars landed at the home of someone with laminate floors and food allergies. 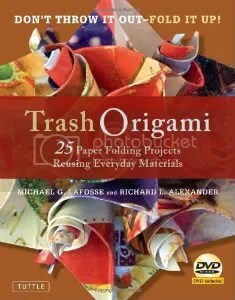 Enter my recycling bin’s new best friend, Trash Origami: 25 Paper Folding Projects Reusing Everyday Materials by Michael G. LaFosse. I love this book because it gives me a creative, fun way to make use of life’s flotsam, and it was clearly written by someone who cares that his reader succeeds. The instructions are clear and well-diagrammed, and unlike many origami books, there are full-color pictures of every project so you know exactly what you’re working toward. Even better, the book includes a DVD that shows an artist folding all of the projects, so you are virtually guaranteed to be able to finish what you start. As a book-lover, I am ashamed to admit that the first thing I usually do after purchasing a hardcover book is toss the dust jacket. (At least for books in the studio — my cookbooks need all the protection they can get. 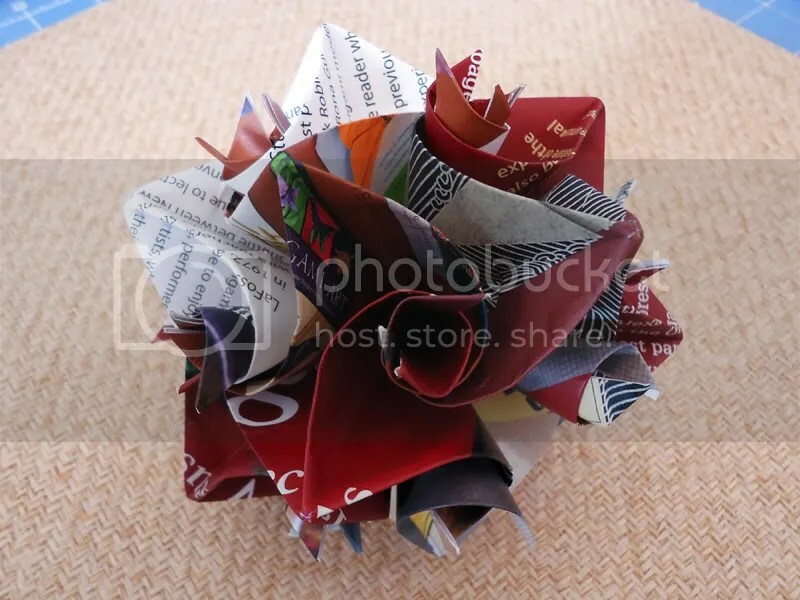 :) In the spirit of Trash Origami, I decided to make my first project out of the book’s dust jacket instead of throwing it away; in a further boost to the existentialist symmetry of the thing, I chose the craft pictured on the cover, a Curler Ball. After cutting the dust jacket into a dozen 4″-squares, I folded and curled each according to the directions. 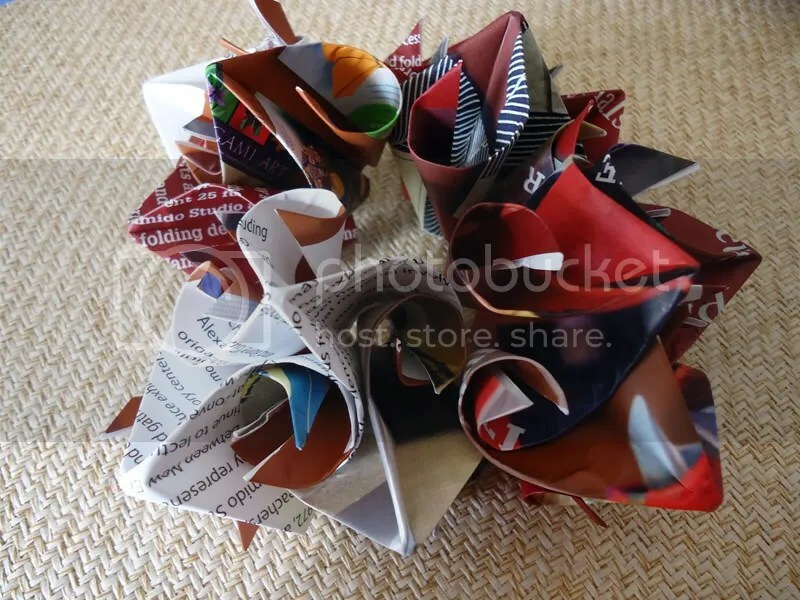 Each of those twelve units was then linked by the curls to make four larger units, then those four were linked again to make the finished curled paper sphere. The final assembly step gave me pause, but with the help of the book’s illustrations and a little experimentation, I got it. I am utterly fascinated by how such a detailed structure can be formed without any cutting or adhesive. The Curler Ball is one of the most complex projects in the book and took about an hour start-to-finish, but others are accomplished in a few minutes, so it’s all about what items and time you have available. 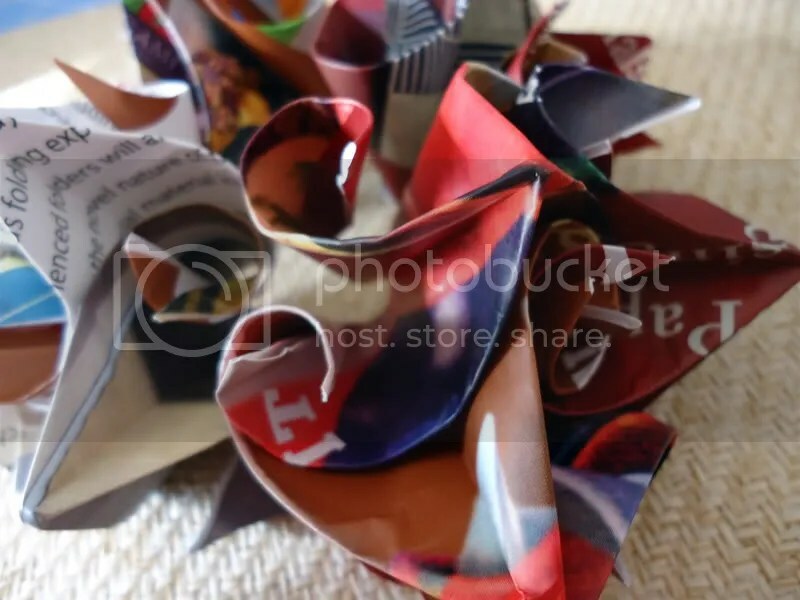 Trash Origami is accessible for any age, although very young children will obviously need a helping hand. 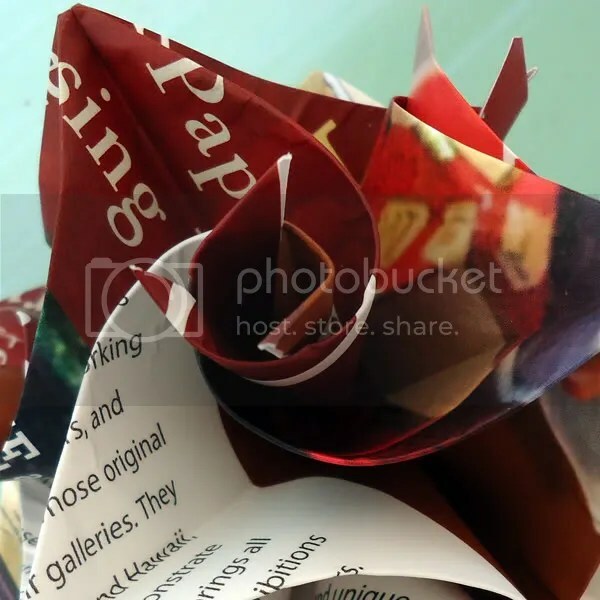 Paper folding is a great trick to have up your sleeve for any unexpected wait (with or without kids), whether it’s in a restaurant reception area or the doctor’s office. Add to that the ability to work with the lunch receipt from your pocket or the month-old grocery list at the bottom of your purse, and you’ve got a real winner. 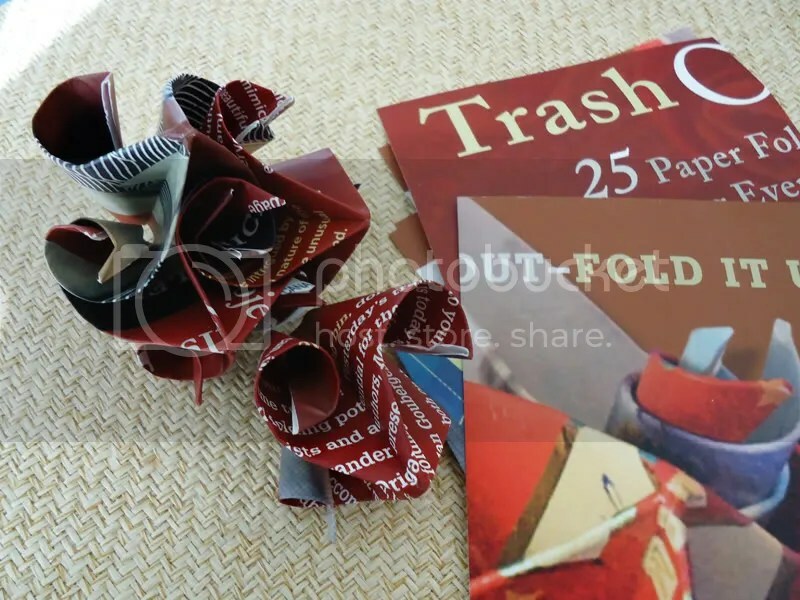 I am a complete documentary geek, so I cannot write about origami without mentioning the film Between the Folds, especially since one of the movie’s featured artists also contributed projects to Trash Origami. My family and I were as riveted by the film’s amazing creations and the art and science behind them as we were by the interviews with the offbeat, genius paper-folders who made them. Beyond the Folds is available to rent and stream on Netflix, and after seeing the potential that paper holds, it’s impossible not to want to dive in yourself. You can find out more and see excerpts at the film’s web site.